A meeting or convention in Anchorage, Alaska brings out the explorer in all of us. 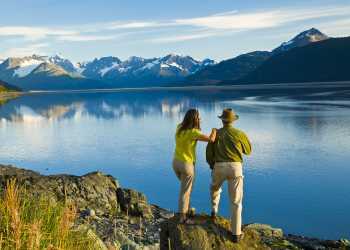 Alaska is one of those places that conjure up visions of untouched wilderness, untamed places and epic adventures. Host a meeting here and give delegates the opportunity to knock a few things off their bucket list. Here are just a handful of the things we know delegates will want to do before or after a successful meeting. Denali is breathtaking, even from a distance. North America’s tallest peak can be spotted from downtown Anchorage on a clear day. Getting a closer look at this giant mountain, and the other peaks of the Alaska Range is easy. Flightseeing trips depart Anchorage daily to circle the mountain once called McKinley, explore the surrounding glaciers, and discover wildlife roaming along the route. Anchorage has four 18-hole golf courses. And with Anchorage’s long summer days, there’s no trouble sneaking in a round. Tee off as late as 10 p.m. and enjoy unforgettable courses. A walk down the fairway can quickly turn into a wildlife viewing trip. Moose, eagles and foxes are regular sights on Anchorage courses. Land a monster fish steps from downtown hotels. Alaska’s legendary salmon spots start right outside the door. Ship Creek is one of the most accessible sport fisheries in the state, and king and silver salmon surge upstream during the summer. And nearby outfitters can provide everything needed for a few quick casts or a whole afternoon. But that’s just the beginning of the fishing. Monster halibut and all five species of pacific salmon are within a day’s drive or short flight away. Cruise in Prince William Sound or on the Kenai Peninsula. See breaching whales, glaciers, pristine waters and clear blue skies. These surroundings are incredible. As the boat moves out from the shore, there are opportunities for spotting moose and bear. Muster up some muscle and board kayaks for a leisure paddle along the shore, or out to sea. The view is much more intimate than looking down from a boat. And there’s no sound of an engine. It’s just the bucket list holder and the sea; and the puffin, and the otter. Dry suits keep a person, well, dry. And warm. What an adventure. Late February and early March are loaded in Anchorage. Over 10 days Anchorage Fur Rendezvous, the ceremonial start of the Iditarod Trail Sled Dog Race® and the Tour of Anchorage fill the city with fun. Known locally as “Rondy” Anchorage Fur Rendezvous began as a small party timed to the return of miners and trappers. In the years since, it has grown to a two week long festival, complete with wild events like snowshoe softball, outhouse racing and the Running of the Reindeer, a Pamplona-style dash downtown. Rondy leads into an iconic Alaska event: the start of the Iditarod Trail Sled Dog Race. The race’s ceremonial start takes over Fourth Avenue in Anchorage on the first weekend in March. The city turns out to cheer the teams as they depart on the first leg of a voyage that will take them across nearly 1,100 miles of Alaska wilderness.